Acme AGQ-406TFR tower/4U Opteron 6200/6300 4-way server. 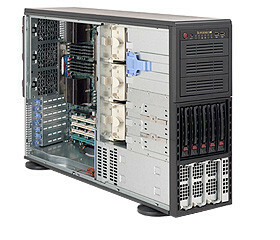 AMD Opteron 6200/6300 with 4U rackmount black. Up to 512GB of DDR3 memory. AMD SP5100 (RAID 0, 1, 10) SATA controller supporting 6 ports SATA-2. IPMI 2.0 remote management w/dedicated LAN, IPMI 2.0 with virtual media over LAN and KVM over LAN support. tower/4U case with Redundant 1400W power supply (80 PLUS Gold Certified). 5 of 3.5" HDD bays, SAS/SATA hot-swap, backplane included. 3 of 5.25" open bays. option to add 1 to 4 CPU cooling kit (per processor). option Rail set not included. Width: 17.8 in. Height: 7 in. Depth: 28.4 in.